Trieste and coffee. There is history - with the arrival and trading of coffee that arose due to the city's status as a free port since the eighteenth century and the stock exchange that was established in the early twentieth century. There is the economic aspect - with Trieste being the most important Mediterranean port in the sector. There are the companies - covering the entire production chain from trading to roasting. There is culture - with historic cafes steeped in a Central European atmosphere and teeming with thousands of everyday rituals and myths. 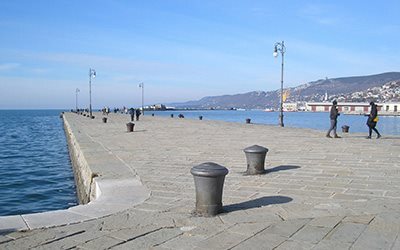 But there is something more to the deeply-rooted identification with coffee that permeates Trieste, something that goes beyond history and the economy. For the city, coffee is more than a café, a black powder, a beverage or a daily ritual - it is part of its spirit. Where, if not here, could coffee - a product as elusive as its aroma, as manifold as the dozens of countries that cultivate it, as rambling as the countries (rarely the same ones) that drink it, with facets that range from chemistry to art - take root? Where, if not in the most elusive, manifold, rambling and multifaceted of cities? Coffee has conquered Trieste not because of its specific identity but rather because of its amazing indefiniteness - volatile as its aroma in a cup, mutable as the "petulant grace" of Saba's verses, and changeable as a day of Bora wind and the salt-scented air that the jute sacks have sailed through. Only in a city suspended in time and space, where nothing begins, ends or is truly resolved, could such a product - one that has no time, no reason to exist and no nutritional value, yet sublimely blends aesthetics and inspiration, culture and style, everyday habitus and love of goodness - find its home. Only in a city of disenchanted and unpolished sociability could this most sociable daily ritual spring up and take root, forming the most civilized interludes of our daily life, which culminate in a coffee cup. And these tell us the value of the simple things that shape our lives and seem pointless, as do all things that are truly essential.